Pinnacle Boats in Whitianga have begun construction on their latest build, a custom 830 model. The boat is being built for a new fishing charter operation ‘Mr Fishing Adventures Ltd’ that will operate all over the upper half of the North Island targeting both fresh and saltwater species. The Scott Robson design has an overall length of 8.38m, beam of 2.5m with an estimated tow weight of 2600kg. It will feature a 6mm thick alloy hull with 4mm used in the sides and superstructure. Built to rigid survey standards, Pinnacle Boats also has one of only a handful of welders qualified to Lloyd’s standard in New Zealand working on the build. 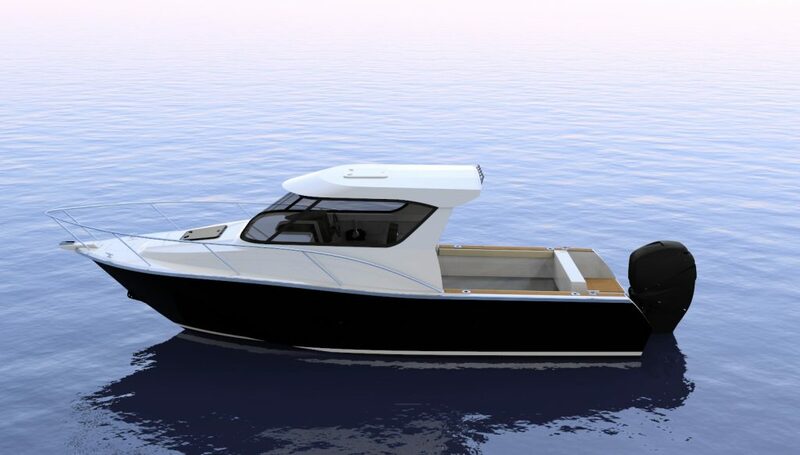 Powering the new 830 will be a Honda 250Hp four-stroke outboard fed via a 600L fuel tank giving the skipper and crew extended daily trips on the water before needing to refuel. Highly customised to suit the owners requirements, the Scott Robson monohedron hull was chosen for its efficiency and excellent sea keeping ability with its 20 degree deadrise providing a comfortable ride for passengers and crew while also providing a stable fishing platform when at rest. The Pinnacle 830 will feature an enclosed wheelhouse with plenty of passenger seating, an Eberspacher diesel Hyrdonic Water and air heater keeping skipper and crew comfortable over the colder winter months. Additional features include a large 15” Furuno multi function navigation display with dual keel-mounted transducers. In the large and workable cockpit there is a large underfloor kill tank, full length cockpit side shelves, dual live bait tanks, four tuna tubes, large volume underfloor buoyancy, 600L fuel tank and a 200L water tank. The cockpit also features a second helm station for the Honda four-stroke. The build of the 830 follows on from the recent launchings of a 930 model and a 720. The Pinnacle 830 is expected to be in the water over Summer.